Uncategorized > New deck projects posted! We are always busy with new deck and porch projects and we like to document the challenges and awesome results for each of the projects! Check out our latests projects to see what we’ve been working on. 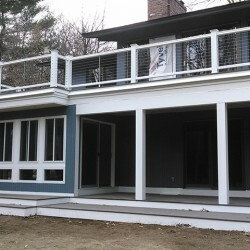 Check out one of our latest deck projects – a Contemporary Style deck. It was built with a rubber roof system and feeney cable rails. An addition was added below the deck and included custom windows and sliders. The decking is Modern View Slate and is solidly constructed with Timber tech posts and PVC trim. The beautiful spiral staircase finishes the deck off! 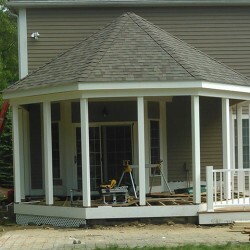 This was a fun project that adds a unique flare to the house with a new octagon shaped screened in porch. It includes a turret roof style, screened porch and open deck. 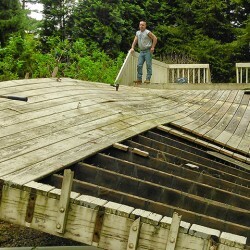 The major storms of the winter of 2015 wrecked havoc on many decks. You can see the damage the snow caused for this home owners deck! We designed and built a new deck with a custom color, maintenance free handrails, PVC, and lattice. This deck will last and will be enjoyed for a long time! A deck doesn’t always need to be a mega-deck. Just adding a small platform deck can greatly enhance your backyard and provide years of enjoyment! 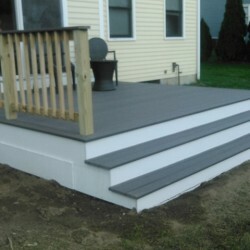 Interested in having a new deck or porch installed or your existing deck or porch repaired? Contact us Creative Remodeling to discuss your project and get a free quote!